The establishment of a new community, White Pines, in 1938 can, perhaps, best be told by those who lived that event and those times. We offer three histories, one by Howard Blagen, the son of Frank Blagen who brought the mill to Calaveras County; one by Frank Blagen, Junior, the youngest son of Frank Blagen; and one by the matriarch of the Dolley family, Louise Dolley, who arrived with the mill and began her new life in White Pines. Howard’s story is in the form of an autobiographical narrative that covers not only the creation of White Pines, but also his upbringing in a lumbering family, the story of why the lumber company had to move from its previous home in Calpine, California to a new town, and his later role as a manager with the American Forest Products Corporation. Frank Junior was a teenager at the time of the move from Calpine. His perspective is unique — he worked in an entry-level position yet was intimately aware of the planning and politics of the new mill. His love for his father, his fascination with all things mechanical, and his stark indignation at the scheming that led to the loss of the family’s mill all are clearly evident in the excerpts provided here. Louise’s story is that of an astute observer and chronicler of community and social life. Where Howard’s story is told from the management level, Louise experienced the creation of White Pines as the wife of a heavy equipment operator, creating a new town and household from virtually nothing. The long-time residents of White Pines are proud of their history. When they started their town, Arnold was a hamlet with a few cabins. Quickly, White Pines became the center of employment, had the much larger population, and enjoyed the benefits of an entire community. Although the town has dwindled as Arnold has grown, the residents of White Pines still think of their home as the area’s first real town. As you drive into town, you’ll pass the sign that identifies White Pines and that proudly declares that White Pines is not Arnold. In 1939, a new post office was opened for the brand new town of White Pines. This is the first postmaster, Grace Libercajt, in front of the brand new post office in 1939. Our thanks to her daughter, Lois Henderson, for this picture and the one below. Lois tells us in her comment below that the post office was painted red. 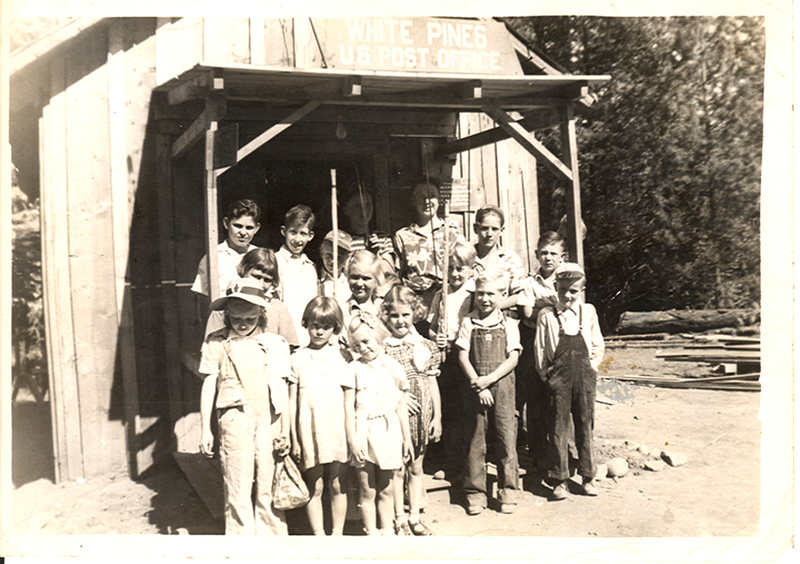 The kids of White Pines gather on the porch of the new post office for a group photo. In the back row second from the left is Dale Brooks, Museum Director and contributing historian. Front row furthest right is Bruce Linebaugh in the sagging overalls. Other people that have been identified are Patti Dolley, second row center; to her right is Mary Lou Werry; and to Patti’s left is Buddy Buck; Patti believes that the girl in the front row with the hat is Patty Blagen; and to Patty’s left is June Griffen; at the left of the back row is Angelo Marzi. Pat Blagen Bradley says that is not she with the hat. Don Hewlett who grew up in White Pines has given us these photos. Don’s Dad was Hick Hewlett who was the paymaster (probably not his real title) and his mother was the nurse. They lived in back of the main office (now the Moose Lodge). 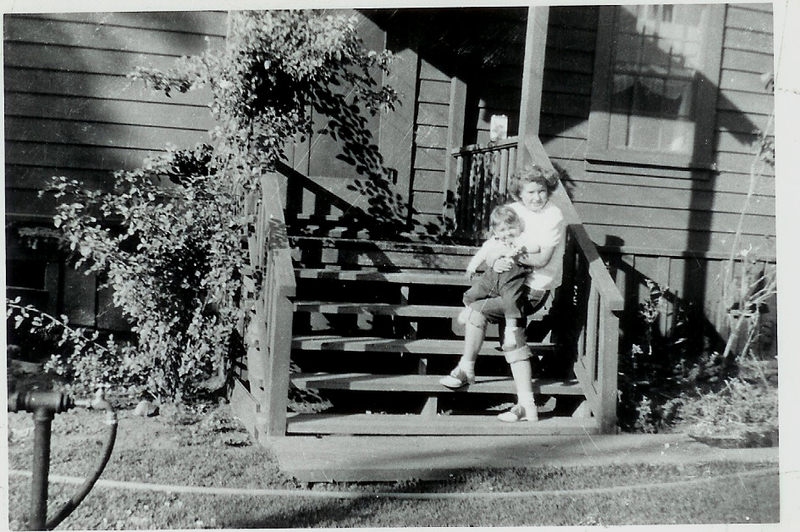 Mina Hewlett holding brother Don on porch of the Blagen Mill office, which also was the Hewlett home. 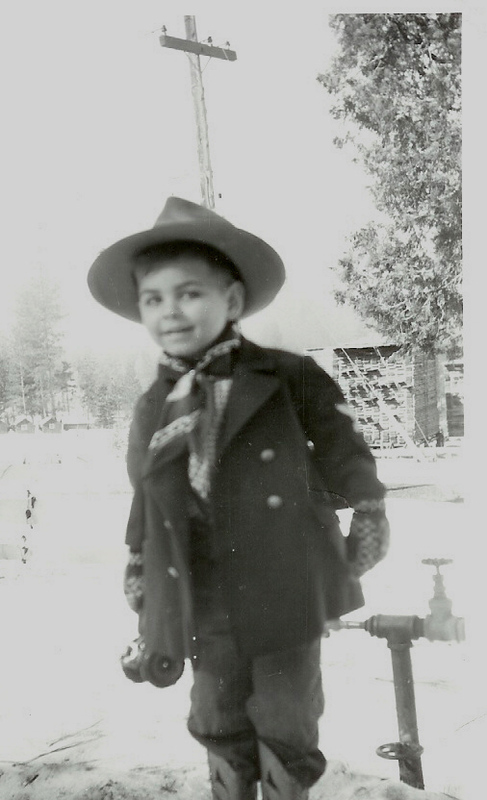 This photo is of Don in his cowboy outfit out in front of the Blagen office and the Hewlett home. Editor’s note: I could PhotoShop the power pole out of Don’s head, but it didn’t seem honest to do so. 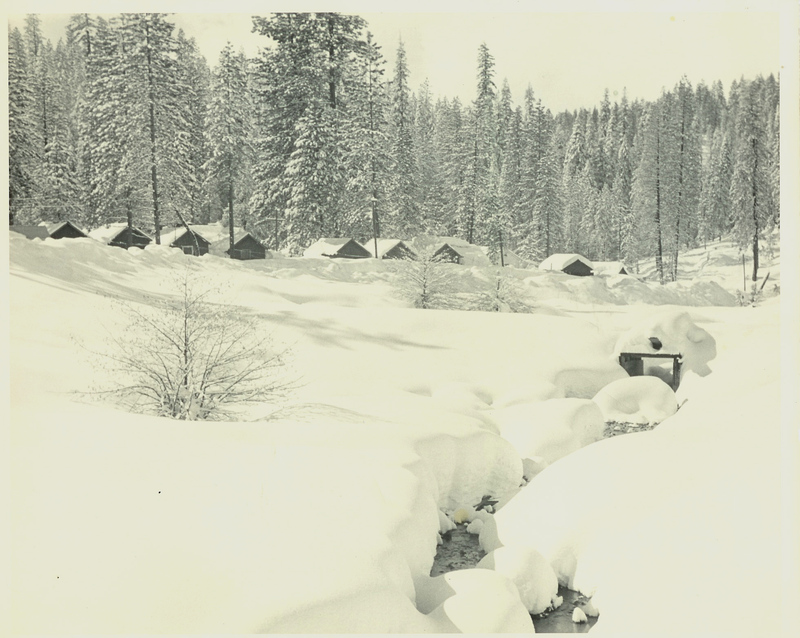 The White Pines camp in Dunbar Meadows (where the museum, White Pines Park and part of the school parking lot is now) in 1949 after a 9 foot snow fall. As a bonus, Louise Dolley follows her story of the move to White Pines with a recounting of the drive over Ebbetts Pass from Murphys to Markleeville. Written in the mid- to late-1980’s, she combines her then-current observations with earlier history and things she saw after her family arrived in Calaveras County. My mother,Grace Libercajt claims to be the first postmaster in White Pines. She died 6 yrs.ago at age98. I have a picture of a little red post office. Unfortunately, perhaps, the photos are in black and white. Not too surprising for that time. When I get a chance to process them, maybe I’ll turn the post office back to red. Nah, I won’t. Hey I just found Arnold on Facebook.. They were looking for some good old pictures and some History. Grace happens to be my Grandma. Aunt Lois you did a great job putting this together. What follows is an e-mail from Sandra Buck. I have moved it here in the hopes that someone can remember her family from the early White Pine years. Message: My father, Elmer E. Buck (known by Sonny or little Ez in the woods – known as just “Buck” by everyone other than family) and his father Millard Buck (I am not certain of his first name – my dad was named after his brother Ezra Buck) – both worked for Linebaugh and Blaggen Lumber Company. I have a box of old photos that must have been taken in the late 20s through the early 40s. 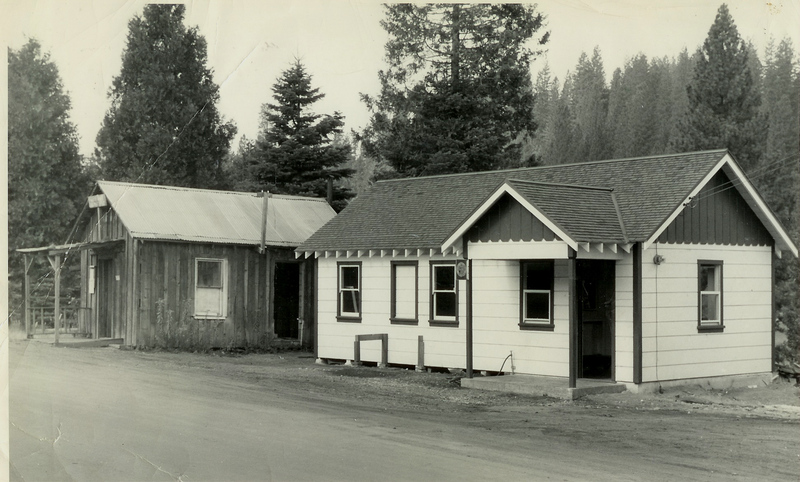 My dad was just a 6 year old boy when he lived with his father in the logging camp (I think in White Pines) – his mother Leona Buck was committed to the Napa TB Sanitarium at that time. 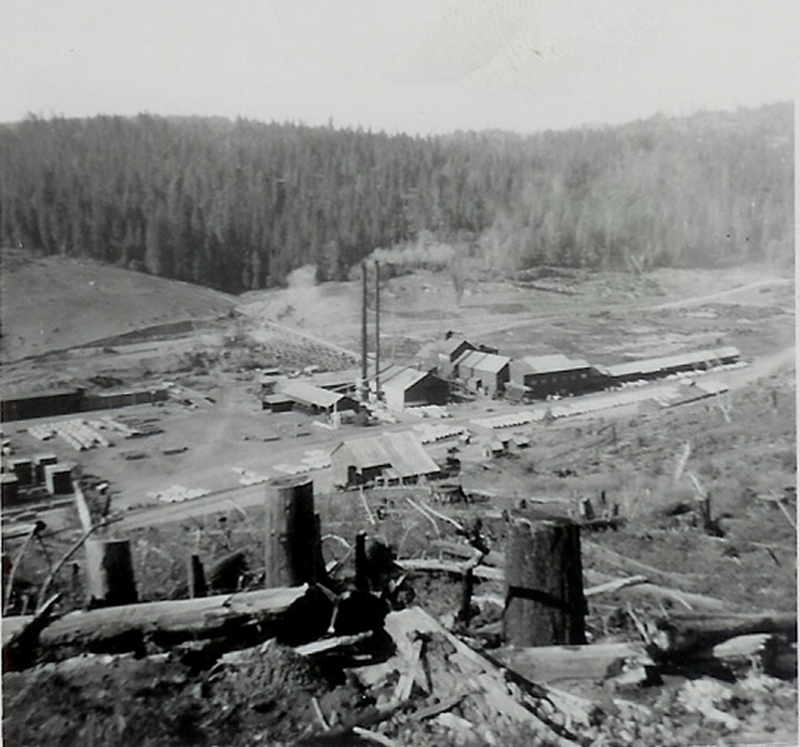 My dad lived with his father in that logging camp as a boy, went to school in San Andreas and then until drafted into the navy during WWII he worked in the woods along side his father. I remember him saying he worked as a “choker-setter”, a drag-line operator and later on a truck driver. His father was a CAT driver. After WWII Buck came back home with his new bride Wanda Buck and shortly thereafter, I was born in Oakdale, CA and lived with my parents in Hathaway Pines until they bought (for $1.00 from a patriotic Druggist in Angels Camp) a two-bedroom house on a meadow in Avery. 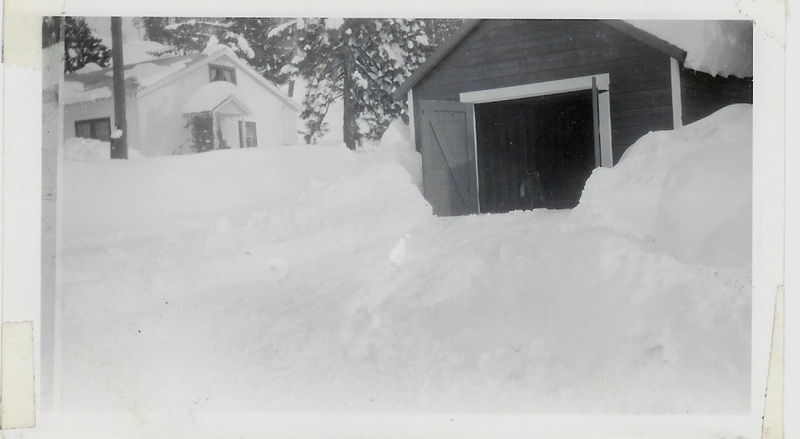 There they lived and my dad worked in the woods until the snow kept them from logging and then in the winter he had a war surplus deuce and a half he hauled garbage in during the winter for the homeowners in the area. I know my dad spoke many times of Bruce Linebaugh and Blaggen logging company. And, I know that they were a source for many good memories for my dad. After my sister Pamela was born in 1947, my parents moved to Modesto and shortly thereafter settled in Ceres, CA. Just before they both died, I accompanied them to a loggers reunion in the summer of 1984 – they both enjoyed visiting with everyone that day and I know they were looking forward to building a log cabin on a piece of property they purchased across the meadow from their first house there in Avery – but, my mother fell ill with Cancer that following winter and she died in March 1985 and my father followed her in death in June 1985 – he died of heart disease. Anyway, if someone could contact me that knew my dad and would be interested in early photos of him and his dad, I would be glad to hear from them. Quite a few photos are of gigantic logs and the people and equipment of those days – much like the ones you have on your website. I am very proud of my parents heritage and I know that the people during that time of his life were responsible for giving him a strong sense of self-worth and self-confidence. When you are forged in the woods working alongside others who understand hard work and solid ethics, you have what you need to succeed in life . . . and they both did. Thanks so much for your hard work and terrific website. it is wonderful seeing the old pix of White Pines! 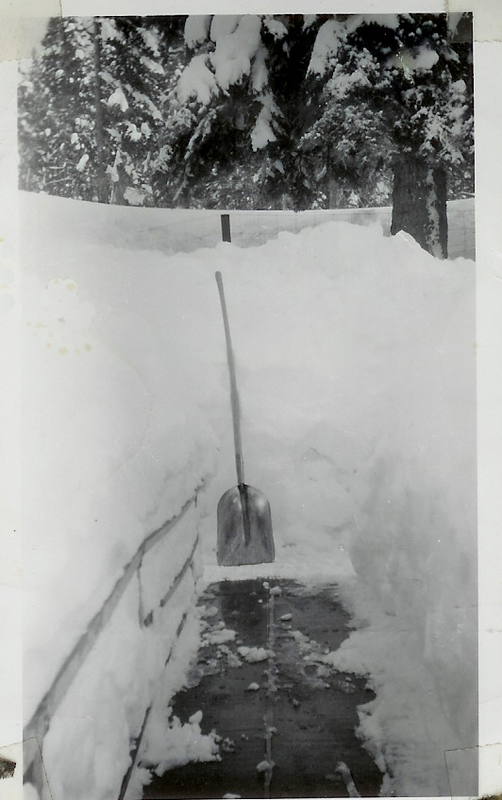 I am a Ballard and as those of you familiar with the White Pines of the 50’s and 60’s know, there were alot of us! my Dad and Brother worked for Doc a long time and we lived in the company houses. Our house sat where the Hazel Fischer Multi-purpose room is now. I love the pictures of the P.O.and Hank’s store, brought back so many memories! Thanks so much! My God the memories, We lived in Arnold for starters and all points in between it seemed. My mom worked in the cook shake in White Pines and my dad and granddad both worked in the mill there as well as my uncle. Seemed it was a family affair in those days. Little did I know I would be working in a mill in Camino 18 years later. Life is a twist huh?